Econsultancy has recently mentioned that most of the customers prefer to do a business with a company who offers live chat tools. 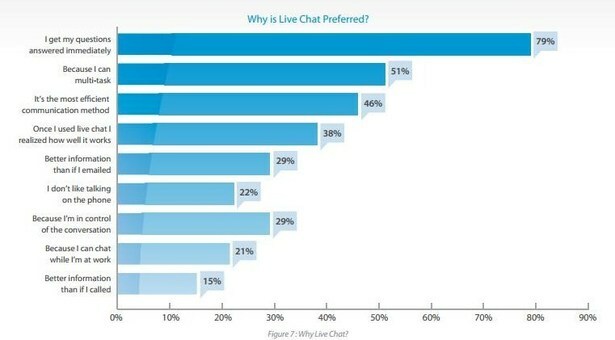 Customers are 3 times more likely to make a purchase from a company who uses live chat versus who don’t. Moreover, even explained why the live chat software is the best customer support tool than other existing customer support approaches. Investing in live chat is an effective step to improve customer service and engagement. Live chat builds a closer relationship between the client and end users of the products. The report shows that there is a significant increase in conversion rates and sales with the help of live chat. Companies that use live chat will get best ROI for the customer support and service. Let’s have a quick trip underneath. In 2015 report on live chat performance, surveyed that proactive chat has the ability to enhance a site’s engagement rate up to 313%. Why not? It’s no brainer that a human being can’t resist the satisfactory feeling, rises after a face to face personal chat session. 72% of customers select a company on the basis of their customer service reputation. Further, this report discovered that 97% of consumers like to talk about their customer service experience in their known circle. And what is more effective and loyal service than a personal voice or video calling through live chat tools? Don’t demarcate your expectations just there. Some live chat service providers offer a full package integrated with CRM solutions. 79% of visitors admitted to having a quick response to their queries and 46% considers the live chat service as the best communicative practice based on its proficiency. Another reason is the increasing preferences for self-service solutions among the modern perceptive viewers as described in 2010 by Harvard Business Review. So, it’s not just providing solutions; it’s about understanding your customers. One UK-based mortgage company trains their reps to find out the personality type of each customer while chatting. Hammer on their emotional pain points and you hold the capability to make them purchase. A study claims that 77% of clients don’t buy without a chat session. In 2016 live chat benchmark report, it has shown 3 statistics on customer satisfaction on the basis of wait time, chat duration and chat per month and all the data stays close to 90%. Also in their 2017 report, they have shown that the customer satisfaction rate by country fluctuates near 100. Live chat is a cost-effective communication channel compared to other customer support. From ROI perspective the average live chat has a return of around 300%. Live chat is cheap and easy to implement than email or phone support. Considering all these factors live chat is the best investment for the companies to convert more visitors into customers and to increase sales and revenue. Integrating live chat into the websites can boost your brand image and can streamline customer support process. To determine the ROI for live chat consider total income generated from the additional sales and the cost expenditure. The human mind is programmed to put their complete trust mainly in personal interactions. And if it comes with a complete demonstration of the usability of the software or product, nothing can be better than that. The whole package of live chat software, combined with screen sharing and co-browsing features, merges with CRM to deliver the effect of a perfect matching. The reps temporarily use the mouse cursor of the users to show them how to do the tasks they want. Also, the privacy of the visitors remains scratch less in the whole process. Isn’t it the easiest process ever? At least 44% of online customers think so. They agreed that to get replied by the support reps in the middle of purchase is the most efficient service a company can offer. Again, another study responded by 38% of consumers who purchased just because of the chat session itself. The first online chat system in 1973, created by the University of Illinois was able to manage five users at a time. Now after 44 years of development and modification, what do you think it is capable of? Live chat has the potential to engage more people with efficiency. How? A customer rep can't handle multiple phone calls or other customer support stuffs but he can surely handle multiple live chat windows, simultaneously. Result? It supports more than one customer in a single point of time. Simultaneously co-browse and live chat with the same customer. It increases the efficiency level of the customer reps. It brings down the overall customer handling budget of a business. It's the latest real-time customer support system out there on the web. So, why it's the need of the day? 60% of customers just hate waiting longer than a minute for phone call replies. The average time rate for the reps to respond in a chat session is 23 seconds and the average time required to solve an issue is just 42 seconds. The magic wand is the 24/7 live support. The reps hold the ability to talk through any confusion or queries during purchase; the clients get confused about. It reduces the bounce rate in a considerable manner. The result reflects at the increased annual revenue in cross-sell and up-sell up to 2.4 times. Also, the cost for customer support reduces to 2.6 times annually. Another survey has shown that 60% of chats make their way to close deals. If you deliver a standard, your customers will expect even more. Don’t pump out their rising hope. It’s worse than never having it. So, aim for a 24/7 availability of the live chat support tool. Make sure to have someone waiting to respond the queries of your customers whenever needed. An offline live chat widget can cause your clients to bounce away from your site. This list is getting bigger with each passing moment. We have gone through a lot of data and new technical ideas relating live chat. Now it’s your turn to decide what to choose and how to maintain. But, if you want to shine brighter than the stars, it’s worth to shake your hands with the modern technology.